While most snakes reproduce by laying eggs, live-bearing strategies have evolved in more than 30 different lineages. On first glance, live birth appears to differ greatly from egg-laying; however, in snakes, they are largely similar processes. 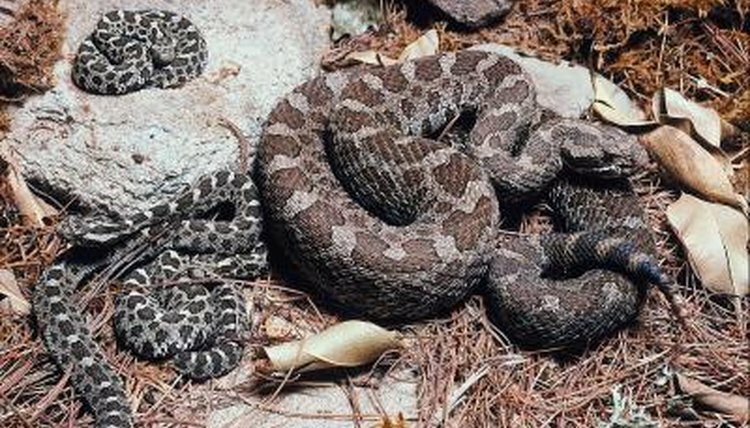 Some live-bearing snakes produce litters containing dozens of small babies, while others produce litters containing only a few, relatively well-developed offspring. Ancestrally, snakes were exclusively oviparous, or egg-laying, animals that deposit their eggs about halfway through the developmental period. Some evolved to bring forth live young. In live-bearing snakes, the young primarily derive nourishment from egg yolks, rather than directly from their mothers; accordingly, scientists classify these snakes as ovoviviparous, as opposed to those animals that are truly viviparous. Live-bearing species enclose their young in transparent membranes -- rather than calcified eggs -- and hold them inside their bodies until they're ready to “hatch,” at which time the female gives birth. The number of ovoviviparous species increases with distance from the equator and height above sea level. Herpetologists hypothesize this is because ovoviviparous females carry their young with them as they travel and can bask in the sun to raise the temperature of their bodies and their developing young. Conversely, oviparous species deposit their eggs on the ground, where the cool temperatures of mountainous habitats and northern latitudes prevent proper development. In his book, “Snakes: The Evolution of Mystery in Nature,” herpetologist Harry W. Greene compares the tendencies of snakes that exhibit oviparity and ovoviviparity. According to Greene, egg-laying snakes produce egg clutches that are, on average, 20 percent larger than the litters of ovoviviparous snakes are. However, live-born snakes tend to be slightly smaller than those hatching from eggs, resulting in litters that typically contain more individuals than clutches of eggs do; litters average 11 young while the average clutch contains seven eggs. Most live-bearing snakes produce moderate numbers of young, numbering between 10 and 30. However, some species produce very large litters. Diamondback water snakes (Nerodia rhombifer) sometimes produce more than 40 young. Other species are even more prolific: northern water snakes (Nerodia sipedon sipedon), fer-de-lances (Bothrops asper) and tiger snakes (Notechis scutatus) occasionally produce litters containing more than 100 offspring. The record for the largest documented litter belongs to a puff adder (Bitis arietans) that delivered 156 young. The presence or absence of predators is an important factor influencing the size of offspring and litters. In general, when comparing closely related snakes, the one with fewer natural predators often produces litters of fewer, larger young than those from predator-rich environments. For example, common boa constrictors (Boa constrictor imperator) live alongside numerous predators in South America, and produce litters of 20 to 60 very small young; by contrast, Madagascan ground boas (Boa madagascariensis) -- who must avoid relatively few predators -- produce litters containing about six, very large offspring.